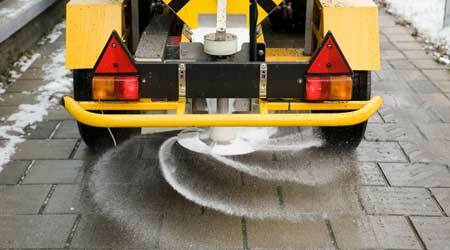 Pre-spreading salt brine and using potassium formate may allow facility managers to eliminate rock salt from their snow removal strategy. Another way to cut the amount of salt used is by spreading salt brine before the storm hits, rather than waiting until the snow is on the ground and trying to melt it with rock salt, Gilleland says. The idea is to “get away from de-icing and toward anti-icing,” he says, adding that an application of brine can reduce the amount of chloride needed to melt snow on a parking lot by about 90 percent. The salt itself doesn’t melt anything; rather, it has to turn to brine in order to work, Gilleland says. “When you apply rock salt, it sits there for some length of time before it turns to brine,” he says. Applying salt as brine accelerates this process. Moreover, the brine can be applied in advance, as it doesn’t wear off. Instead, it “just dries, and waits for the moisture to come,” Gilleland says. Many departments of transportation apply brine to bridges and steep inclines ahead of storms, to head off slipperiness, he adds. Some organizations use different liquids, such as cheese whey or beet juice, to create the brine. These liquids can lower the freezing point of the brine, which also can cut the amount of salt used, Gould says. Another chemical, potassium formate, can help with snow and ice removal, is readily biodegradable, and doesn’t harm pets, concrete, or plants, Clemmer says. (His company is behind Entry, a deicing product in which potassium formate is the main ingredient.) It works to temperatures well below zero degrees F.
“Potassium formate has been used for a long time on airport runways, and it’s an exciting option,” Welzer of Green Seal says. While the product is more expensive than rock salt, it’s not tracked back into the building and so doesn’t create the maintenance challenges that salt can, Clemmer says.